Brownie's Chair: April Turtle Trot, May WIPocalypse and more! 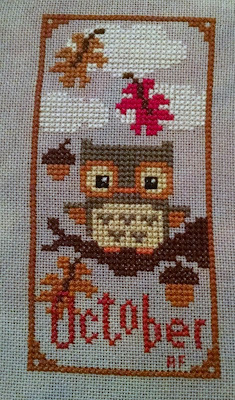 Welcome to Brownie's Chair, my blog about all things cross stitch. Feel free to have a look around, and email me if you have any questions or suggestions! April Turtle Trot, May WIPocalypse and more! Well, with the continued craziness that I posted about at the end of last week, still not having internet access at home (living in the country is just great sometimes), STILL being sick with this stupid cold, Mother's Day on Sunday, etc. I missed the check in dates for both WIPocalypse and Turtle Trot. But better late than never! First of all, thank you to everyone who left well wishes on my post last week. They were much needed. My boss's husband had a major heart attack last Wednesday, leading to my rough week at work in trying to fill in for her. Sadly, her husband passed away on Saturday, so Sat/Sun/Mon were busy trying to get things ready and settled for the funeral. So that's over with, but things are still a little crazy as we try to adjust to the "new normal". Secondly, I hope everyone who celebrated Mother's Day had a great weekend, and you enjoyed the time you spent honoring your mothers/sisters/aunts/daughters/etc. I cooked up a storm last weekend, which sadly cut into my stitching time, but oh well. Now, onto the updates I suppose. First off, the May WIPocalypse check in as hosted by Measi. May's question is: I would like to know if you look for LNS’s when you travel. What is the favorite shop you’ve ever found? Sadly, I seem to never live in an area that has a LNS around. I did find one in Placerville when up at Apple Hill when I lived in California, and one in Boise when visiting my grandparents (which sadly had gone out of business when I went back to look for it last year). Usually when traveling I don't have time to explore for an LNS, I have a time schedule I need to keep to, but I want to possibly do it more often in the future. Sadly, I have not found one near me in Mississippi yet either. Anyone know of a LNS around the Jackson area? As far as progress, I'm going to combine this with my Turtle Trot progress check-in, since some of the things I worked on this month were TT pieces. I made more progress on January, but I can't find the progress pic I took anywhere! I will have to update this post when I find where my camera stashed it. 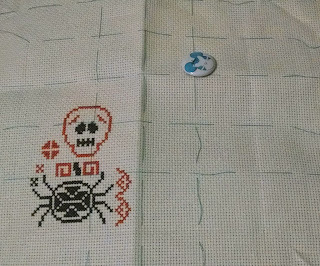 Made a huge counting mistake on this one (several times) so I had to frog a bunch and modify the pattern a bit (or risk having to frog the entire pattern). I think it turned out okay anyway. So sadly, not a whole lot of progress going on there with those pieces. Hopefully after June things will settle down a bit stitching-wise though. In April I also had two other non-Turtle Trot progress finishes, Easter Egg Topiary and Friends for Life, both of which were charity stitching donations. I don't anticipate this taking very long. As you can probably tell, this is an initial, specifically a N. It's for an Initial Exchange swap I signed up for on Facebook. This is from the Buzzy Bees Alphabet by Lucie Heaton, I think from an old CrossStitcher magazine I have lying around. 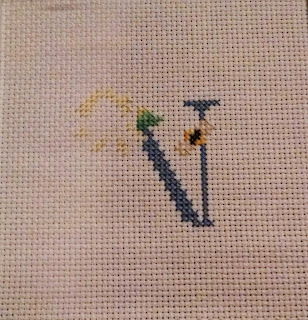 Sorry for the wonky lighting, the fabric is actually regular white aida. 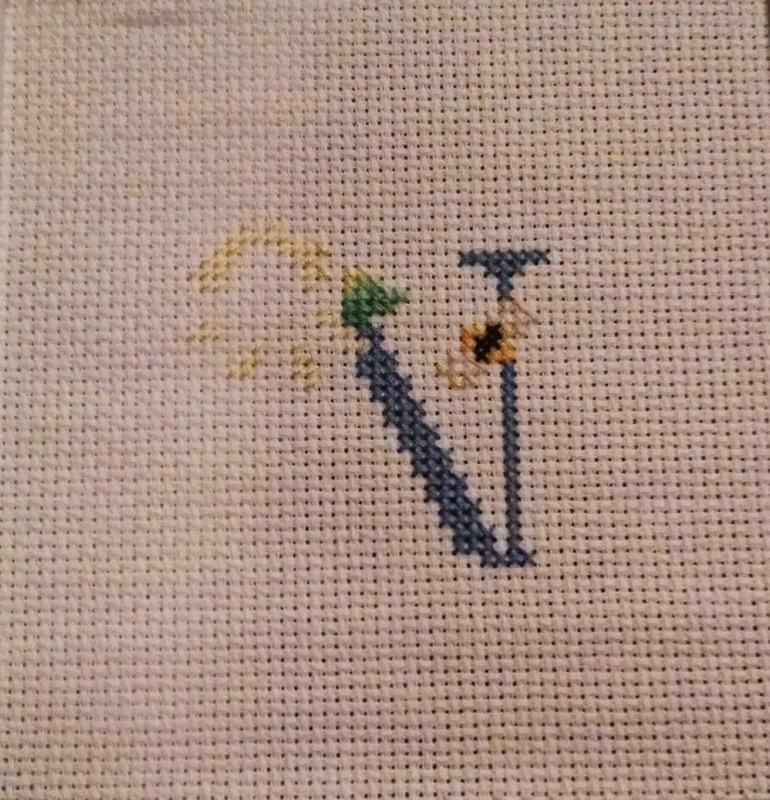 It's so hard to get good pictures of my stitching at night. Well, that's it for progress shots today. Hopefully your stitching is all going better than mine! Congratulation on your great progress Alyssa! Congrats on your progress, you've trotted along nicely. :D Shame about you're boss's husband, the new "normal" will be weird for a while I suppose. This is my cat Brownie, the mascot of my stitching blog, and namesake of Brownie's Chair. 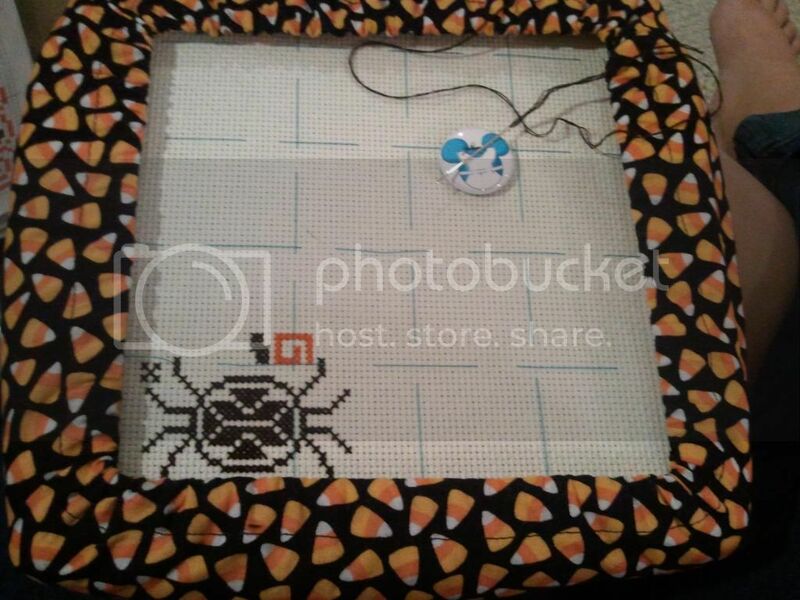 Check out my stitchy items on Etsy!